Manchester Terrier is a popular terrier breed and it has two varieties: Standard and Toy. This breed of dogs was developed in the United Kingdom during the 19th century to hunt rodents. The popularity of this breed of dogs has gone down although this particular dog breed makes a great companion and has good working capabilities. The Manchester terrier dog breed is a fast and compact dog with alertness and athletic abilities. This dog breed is a very active and intelligent pet. This graceful breed of dogs is very well mannered and responsive compared to others dogs in the terrier category. Manchester Terrier dog breed is a very faithful and a devoted friend to its owners. This dog breed is independent, and loyal.The Manchester Terrier works well will older children and are not good with other household pets. Manchester Terrier like other companion dog breeds love human companionship and seek attention from their owners. This dog breed will not work well alone and should not be left without company. Itis know to be become bored and destructive if left alone and unattended for a long period of time. 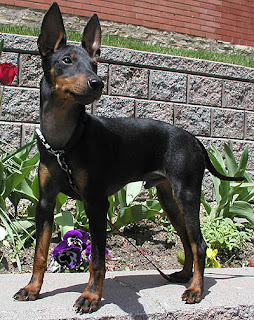 The Manchester terrier has a short, tight-fitting coat, it's color is jet black with mahogany markings. This breed does not shed much hair and requires minimal grooming, some brushing will take care of what little lose hair there is on the coat. For the betterment of your dog whatever breed it might be it is essential to check and clean the ears and teeth of your pet on a regular basis. Infant obedience training is very important for the Manchester Terrier. this dog breed is always ready to please and fast at learning. This breed of dogs does not work with strict training methods or corrective discipline. They do best with thorough firmness, fairness, consistency, persistence, respect, and patience. The Manchester Terrier does well in agility and obedience trials. This enthusiastic breed of dogs needs an obscene amount of hard exercise. The Manchester Terrier enjoys regular walks as well as safely fenced off lead play sessions where they are able to romp and run freely. It is imperative that this breed be looked after at all times as they are expert escape artists. The Manchester Terrier will do okay in an apartment style living as long as their excessive barking can be controlled and they are given sufficient exercise, and attention. This dog breed likes warm weather but should not be left in the sun for any length of time.